The purpose of this chapter is to make a combination of two concepts CSR and digital marketing and to find out the various challenges faced by practitioners for effective CSR communication. A total of 15 in-depth interviews were conducted in a leading automobile company. The interview transcripts were analyzed through thematic analysis. 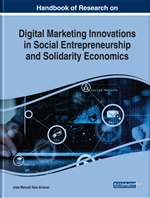 This chapter proposes different themes derived from the perceptions of the respondents and corporate reputation, public awareness, CSR efforts, profitability, CSR commitment, public image were found as the challenges faced by the practitioners. This chapter will provide insights to the practitioners on how to make effective CSR communication for further corporate reputation enhancement. It could also provide a platform for further debate between automobile controllers and significant stakeholders on how to tactically converse their CSR in the automobile concerns and enhance stakeholder commitment. Due to globalization, effective material information, ideas, and progression of unique threats for the universal communities, it upturns complexity get along futile to excerpt an understandable conceptualization of corporate social responsibility (CSR). Sethi (1975) initially invented the term ‘corporate social responsibility’, extended by Carroll (1979), then further classified by Wartick and Cochran (1985). Essentially, the thought behind the CSR is the identification that firms do have moral commitments and that they have also to reply practically to social forces. The CSR activities are going away on for old time. The shifting times have posted the latest set of challenges and opportunities to individuals and organizations. The most significant facet of the shifting times is to predict the changes in advance to carry out in-depth research to inspect the pros and cons of the planned course of action. The organizations should have well-emerged means to disclose the CSR activities which are suggested after the complete examination of challenges and opportunities. The economy is building a conversion towards becoming an extremely competing digital economy. The technological advancement is breaking innovative perspectives of opportunities in diverse fields of business and the CSR area as well. The major driving force of the CSR actions in the digital age should be to influence and incorporate the present and newest technologies in the practice of releasing CSR venture projects, agendas, and actions. The incorporation of technology in CSR is a mounting job and is pretty challenging. The shifting times are altering the outlook of people at a rapid rate. It is vital to be aware of the diverse prospect of every stakeholder in the CSR sphere. The economy has to pass through a long and hard work to bring about the anticipated ideas of digitalization. The corporations should initiate building their assistance by focusing on a variety of digital actions to construct their most favorable involvement in the process of country development. The corporate houses should outline a short-lived, medium-lived, and long-lived business plan for the contributions which they plan to formulate in the region of digital technologies and its utilization in the domain of CSR. Researchers feel that there are a lot of possibilities for corporations to control the challenges and opportunities in the fields related to information technology (IT). The corporations can amalgamate their proficiency and IT expertise into the systems, actions, and operations, to donate to the holistic advancement of the world. The government can take part in the position of coordinator to diverse corporate houses in transferring their inputs working in the IT field. The CSR conceived to advance communal prosperity through flexible business methods, and hand-outs of the corporate property has emerged noticeably in the preceding decade (Kotler & Lee, 2005). Enhancement of awareness headed for further tactical execution of CSR, relatively than limited, below encounter leadership, can be acknowledged as a viable number of organizations (McKinsey & Company, 2011). Exchanging information regarding CSR in the direction of stakeholders has reversed on account of the appearance of innovative digital technology in modern times. Web 2.0-based services, like as digital medium, award companies space to get in touch with their patrons on an entirely contrasting point earlier than. This endeavor many assistance, but also occur with jeopardy. Originations may exploit shared platforms to converse and talk about CSR notion and performances, but individuals and acts in groups moreover include to get the capability to utilize them as a podium to contact the corporation and dishonor them in public, possibly creating harm to the company’s status. Although corporations have initiated to widely embrace digital platform as a device for advertising, social dealings, and web care targets, the examination of practical online talk relating to the area of CSR has been underrated distantly (Heckadon, 2010; Nair, 2011). Facebook: Social media technique to get users together to socialize at a common shared platform for communication. Stakeholders: Formed by the combination of people and organizations (private and public) interested in the firm. Search Engine Optimization (SEO): Optimization of a website to place it in the top positions of search engines. CSR: Acronym of corporate social responsibility, that consists of fulfilling economic, social, discretionary and legal obligations towards society to increase corporate reputation and foster social change. Digital Marketing: Techniques and strategies focused on reaching goods and services to a target audience by using online tools based on the internet and digital devices. Search Engine Marketing (SEM): The use of tools and strategies to optimize the visibility and accessibility of sites and web pages with the use of search engines. Brand Positioning: The creation of a unique and positive impression on customers and marketplaces for being competitive in the market.